Picture a business card. Do you see a simple name, address, phone number, and maybe a company logo? Well, those are the business cards of the past and they’re more out of style than horn-rimmed glasses and 90s grunge boots. Come to think of it, that’s about the time when traditional business cards started to disappear, with many people favoring the simple exchange of online details. You might think the whole idea of business cards is dead, but that couldn’t be further from the truth. Business cards are very much alive and with the current push for perfect branding, demand has never been higher for expertly-designed cards that perfectly reflect the companies they represent. If you want to see how it works, check out the following examples to see brands that got it right with their business cards. 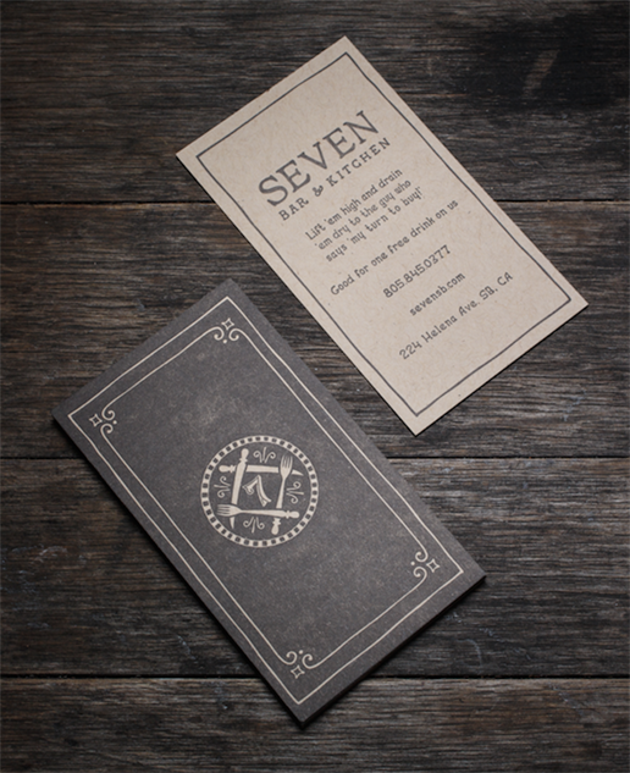 Glancing at the business card for Seven Bar and Kitchen in Santa Barbara, it’s immediately clear what the company does and the image that they are trying to project. Obviously, it’s a bar and restaurant, but what’s the style of the place? If you guessed speakeasy, Prohibition-era, Wild West pub that serves artisanal food and cocktails, you would be exactly right. If you looked at their menu, what cocktail would you expected to be listed first? That’s right – an old fashioned. Looking at the details, you can begin to see how this image was transmitted without anything needing to be said explicitly. From the front of the card, you already know it’s going to be a restaurant based on the forks and knives, but the old-timey central design and borders pushes your mind to start imagining silent movies, gangsters, and hidden hideaways where drinks were illegally served. Flip the card over and you’ve got full confirmation, which is exactly how a business card should be – a little bit of graphic tease on the front that catches the eye and an explanation on the back. With a purposely dated font and the muted black and beige colors, you already know what you’ll find when you walk in the doors at Seven. Another example of a great business card that took a slightly different route is the one used by Rational Group employees. This one is a bit trickier as the name of Rational Group doesn’t give much insight about the business. The scale of the card implies that it’s a big company, but no clues about what they actually do. However, the text at the bottom of the card and the red and black spade outline give it away – it’s the parent company of online giant PokerStars. You know what companies this card represents, but what is this card saying with the design? The design of the card is relatively simple, which is an intentional choice – you can be sure that the Rational Group could have gone crazy with a gaming-centric image of cards, chips, and sunglasses. Instead, they kept it simple, exactly like how the company operates. Those that have used the poker software know that it is straightforward, intuitive, and created in a manner to eliminate all barriers between the player and the game of poker. 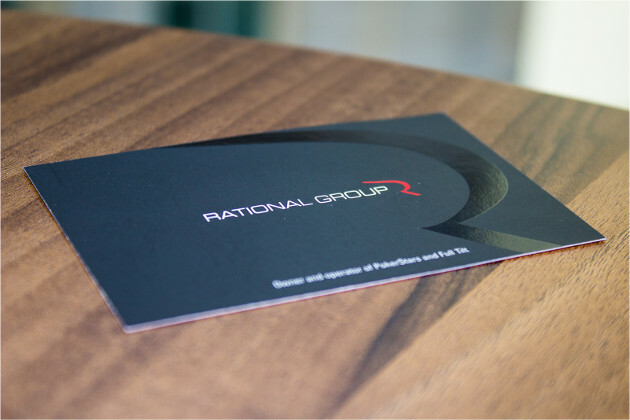 With just a hint of playfulness, the business card is a perfect reminder that the two core values of the Rational Group are simplicity and the game of poker – no distractions and no unnecessary embellishments needed. For this last example, let’s play a little game. Looking at the 30 Park Place business card, you know they sell apartments, but what type of apartments specifically? Luxurious or low-rent? Suburbs or downtown city center? Pets allowed or not? Just kidding with that last one, but you get the idea. It’s the kind of place where if you need to ask how much the rent is, it’s probably over your budget. In fact, 30 Park Place is one of the most exclusive residential towers in downtown Manhattan, with penthouse units going for around $65 million and drawing only the richest of the rich. So, what makes their card work? 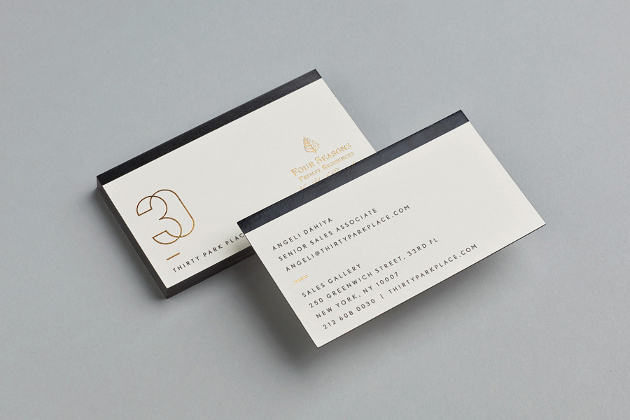 First, check out the colors used – deep black on an off-white background with embossed gold foil. There’s no need to pack too much information on the card as anybody shopping for that kind of real estate in New York will be well aware of the building. On the back, the all-caps lettering and the title of Senior Sales Associate (not just real estate agent) imparts a level of exclusivity that you just don’t find when looking for a Brooklyn studio. Also, imagine this card in a stack of others – it’s going to stick out with the dark black line, exactly how the building does compared with others in the area. Like all branding elements, handing a potential customer a business card is giving them visual information about the company, possibly in a way that you couldn’t explain with words. They look at the card and are able to translate that physical card into what your business stands for. Although the above brands nailed it, there are many out there whose business cards are not really in line with the company’s vision. When these cards are handed out, it’s like a lie – the person receiving it is already developing mistaken opinions about the company. That disconnect in signals could be a motivating factor of whether they decide to make a purchase with the company or not. Consistency in business cards and branding is paramount – that unity of vision resonates with the right clients and gives the company a better sense of definition. Before you print up your next batch, think about what your business cards are saying and whether it really is the message you want to send. What does the company stand for and do you get that feeling when you see them? If not, it might be a good idea to head back to the drawing board.